These sessions are designed for those who want to address an injury or improve core strength, spinal stability, posture, flexibility and muscle tone. In order to do everyday tasks it is important to have a strong centre, your core muscles are like your body’s foundations. If they are weak then your body will find it more difficult and inefficient to do thing like lifting, walking, running and playing sport. You may become more susceptible to injury. Core muscles are essential in all sporting activities and having a strong base on which you move can improve your performance in all activities. Classes are graded into mixed ability (which is suitable for all beginners), intermediate, and advanced. 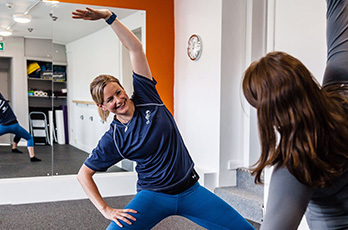 The mixed ability class is suitable for those who are new to Pilates or have ongoing clinical need. 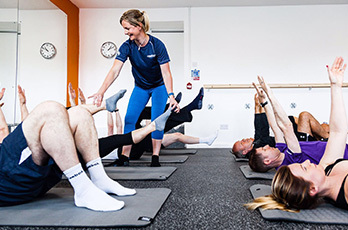 The advantage with Pilates By Physio is the extra knowledge we bring to the classes regarding musculoskeletal problems such as knee, shoulder, back and neck pain. Some clients stay in this class to keep on top of any aches and pains, other prefer to move through the difficulty levels and move onto the intermediate and advanced classes. Safety is the key and the instructors will guide you as to when you are safe to move to the intermediate class. As the class numbers never exceed 12 clients, there is still lots of scope to tailor the exercises to suit each individuals ability. A lot of the classes have been running for several years now so there may only be a few beginners starting in each new block. This means beginners will get the individual attention required to learn the new skills without ever being singled out. Intermediate class is for those who have gained the appropriate level of strength and control in the beginners and wish to be challenged further. If you have attended pilates before and would like to join the intermediate class, please contact us to discuss what your ability is. This class is ideal for people who are interested in sporting activity and are trying to avoid injury and improve performance with a stronger core. The advance class builds on the strength and skills learnt in the other class but incorporates much more challenging exercises. The classes are booked in six weeks block. You will be given some information prior to starting the class which explains the principle behind Pilates and how to find and activate the correct muscles. This will give you a head start in your first class and help you understand more about pilates.